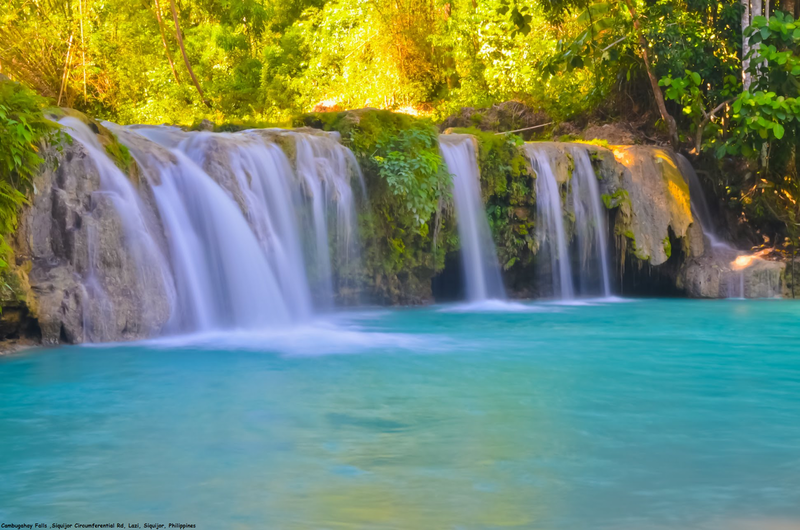 Cambugahay falls is a must-visit when you’re in Siquijor. It’s very easy to reach; no long hike needed. From the parking area, there’s a sign leading you to the waterfalls. You’ll just have to go down a flight of stairs. It will only take you around 5-10 minutes. Cambugahay is a 3-tiered waterfall.First tier water is very clear and blue. At the lowest tier, there’s an improvised swing you could use for free. The water is very swim-able. You could also jump from the top of the falls since the base is deep enough. Make sure you ask the guides there where to jump. The lowest tier is where most tourists swim. It’s the biggest and probably the deepest as well. There are available makeshift tables and chairs free of use. If you want a more quiet and peaceful ambiance, there are two more waterfalls above. Both basins are also swim-able and less frequented by visitors. People usually crowd at the 3rd tier where the Tarzan swing is.